Hi everybody! I've been so busy lately running from one place to another and coming home to make stuff that I haven't been able to be in the computer much. I'm taking a 4 day workshop in a local museum. 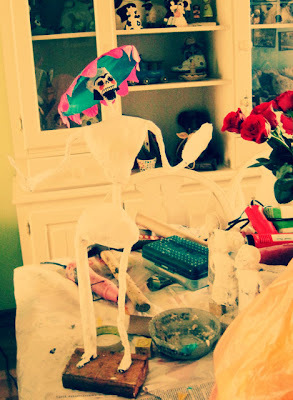 I'm learning to make traditional paper mache Catrinas. And guess whom I making into one? Frida of course! She will have a hat too and a big pink dress. But first I have to paint her white. My house is a mess right now and we only have been eating chicken nuggets but it's been so much fun! There's paper everywhere and I'm still not finished. 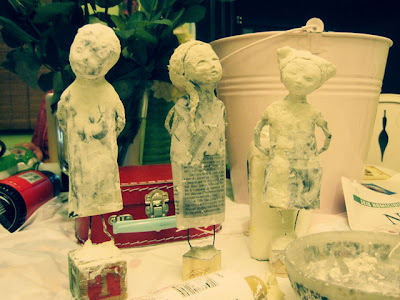 It will be interesting to see how the dolls turn out! I'm sure they will be awesome! Can't wait to see the results, it all looks so amazing! 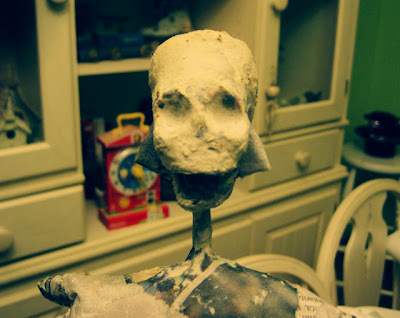 It just looks soo good :) Is great to work with papier machè. I like it a lot. My favorite thing is to make masks. Want to see when "Frida" is done. Have a so good wednesday. By the way, I noticed you are wearing glasses, they suit you. tengo muchísimas ganas de verla terminada..
un besito de ánimo. desde el paraiso asturiano..
it looks like So Much Fun! 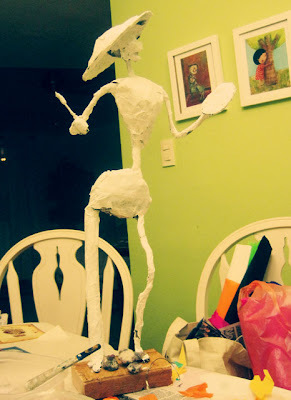 it gets crazy when you start those paper mache projects. i did one last year and it was the same here. lots of crazy meals and me running around with paste in my hair. i can't wait to see frida come to life! Wow! Here's to coffee, dolls and those red roses! I'm so impressed when a 2D artist is SO GOOD at 3D as well - I've just started looking at your work and am so impressed. Thanks for showing some of your progress too. Tú si que sudas creatividad!!! Wow these are so cool, Great to see the works in progress!! Off to your Etsy shop I go!! 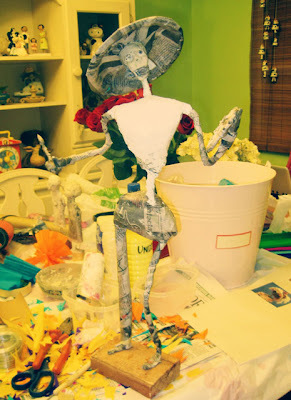 I am looking so forward to your papier mache, Danita! 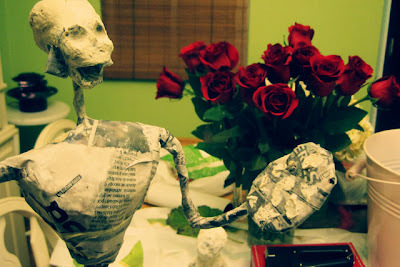 YAY for papier mache! My heart is all aflutter for the three little ones at the end! I wouldn't even paint them except for one solid color. They are SO beautiful...the face on the middle one...AMAZING!! SALE AT MY ETSY SHOP!! The annual visit to the pumpkin patch!